We have the know How To Get Rid Of Bees. Our Bee Exterminator specializes in BeeHive Removals. Don’t let Bees or any other Stinging Insect take over your property. We offer Same Day Service. Let us be your Bee Exterminator Company you can rely on, give us a call today 1-844-305-8999. The Bumblebee is a widely distributed social insect known for its ability to collect nectar from flowers and pollinate plants. Bumblebees are large yellow and black flying insects with a distinct buzz. There is variation in coloration among bumblebees and some species have bands of red, yellow and black. They have stocky bodies that are covered with many hairs to which pollen adheres. Bumblebees are social insects that live in colonies. The queen bee, drones and worker bees all have specific tasks to help support the colony. The queen bee lays hundreds of eggs. The average mass of pollen and nectar carried by bumblebees returning to the nest is around 25% of their body weight. The bumblebee is nearly double the size of the honeybee. Bumblebees are fat (at least in bee terms) and hairy, their size relative to their wingspan giving rise to the myth that science can’t explain how they are able to fly. Honeybees are sleeker. Bumblebees tend build their nests underground (though they have been found in walls), and sometimes in tunnels constructed by other animals. 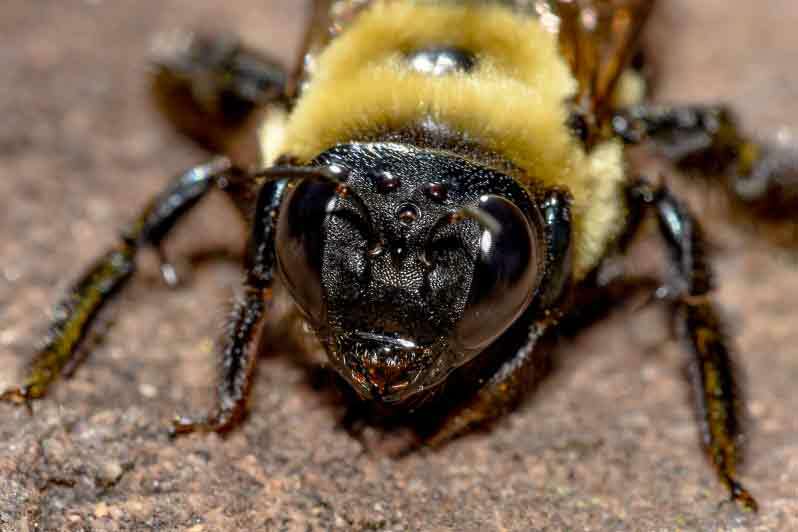 Carpenter Bees are commonly sighted in the spring in New York NY, Westchester County NY, Rockland County NY and in Orange County NY hovering like a helicopter around eaves, porch rails, and under decks. Sometimes carpenter bees are called "wood bees", because they bore into wood. Carpenter Bees do not eat the wood for nutrition. Carpenter bees, as pollinators eat nectar and pollen from flowering plants. 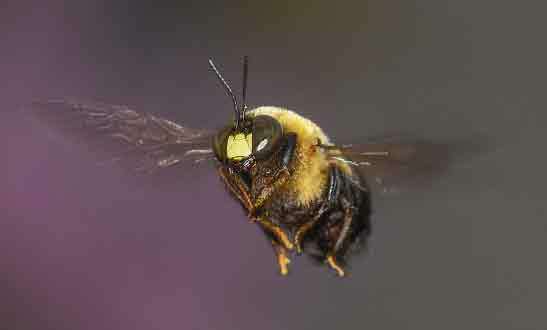 Carpenter bees resemble bumblebees in both size and appearance but are not social insects. They construct their nests in trees or in frame buildings. Most of the top of the abdomen of carpenter bees is without hairs and is shiny black in color. By contrast, the abdomen of bumblebees is fully clothed with hairs, many of them yellow in color. If you see several large bees hovering near the eaves of the house or drilling in wood, you have carpenter bees. There is only one species of the large carpenter bees. The male bee is unable to sting. It is the male carpenter bee, which is most often noticed. They hover near the nest and will dart after any other flying insect that ventures into their territory. Dependable Exterminating specializes in Carpenter Bee Elimination. 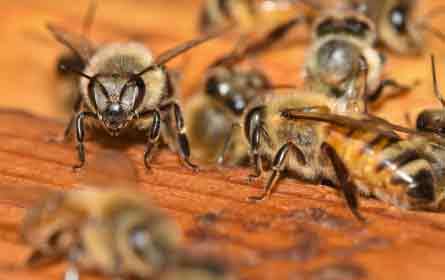 Honeybee Swarms initially enter walls of your home through some small crack or opening. A fallen knot hole; a broken spot in the mortar; an opening around a light, faucet or electrical meter; or a gap between the brick and the siding on a house or building makes an excellent entrance site for a swarm of bees looking for a home. Once inside the wall, the bees quickly build comb for brood and food storage. In just a few days, the comb can be several inches long and the width of the studs. Initially the colony may go unnoticed, but once the colony numbers expand, bees are noticeable if they are in a traveled area. 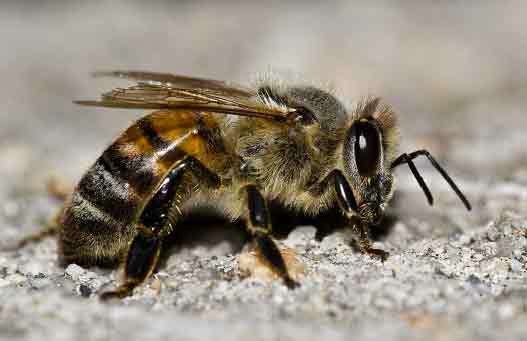 Honeybees are relatively small, hairy, yellowish brown insects, though dark brown or black honeybees are not unusual. They are normally kept in bee hives, but they will nest in trees and between the walls of houses. Quite often during the months of May and June, and less frequently throughout the summer, “swarms” of honeybees may be encountered on the sides of buildings or on nearby trees. These swarms are composed of honeybees that left the old hive to start a new one and they may include as many as 4,000 to 30,000 bees. The swarms are generally quite gentle if unmolested and will remain for a day or two before flying to their new homesite.